Owner: Various owners including, but not limited to, Pennsylvania American Water Co., Westview Water Authority, Duquesne Light Co., Southwest Water Authority, Moon Township Municipal Authority, North Fayette Municipal Authority, and Findlay Township Municipal Authority. Scope of Project: Upgrading of the existing infrastructure to include installation of new water mains in rural and urban areas as new distribution systems and replacement of existing systems in an effort to provide better water quality to the public and to meet new federal and local standards, new sanitary systems to new developments and upgrading existing systems to meet new regulations, providing underground electrical ducts and manholes for new industry and upgrading of the existing distribution system. 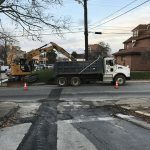 These projects include excavation, shoring, horizontal boring under streams, highways, and railroads, facility installation, testing, maintenance and protection of vehicular and pedestrian traffic and all aspects of restoration including concrete and asphalt paving and landscaping. Projects work either day or night shifts, depending on owner requirements, local ordinances and traffic restrictions.